The environmental sector is a key component of the Canadian economy. 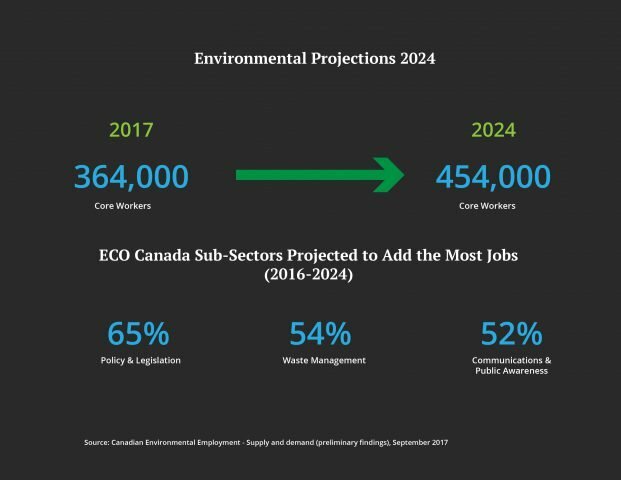 Our latest research findings tell us that the demand for environmental workers is sizable, which is why ECO Canada is exploring new ways of measuring environmental employment to understand the unique characteristics of this sector. In our previous article, we talked about how we explain environmental employment and how skills and training are essential to define what an environmental worker does. Today, we’re presenting some of the preliminary results in our latest reports. In order to spot hiring trends, we need to analyze job ads. That’s what we did between Q1 2013 and Q4 2016: we scraped a large subset of online job postings to see if they required environmental skills, as defined in the National Occupational Standards. This kind of analysis is useful for job seekers, policymakers and researchers. The first group can find information on skills in demand and companies that are hiring. Policymakers detect labour demand trends and researchers can link environmental jobs to existing occupations in Canada’s National Occupational Codes system. 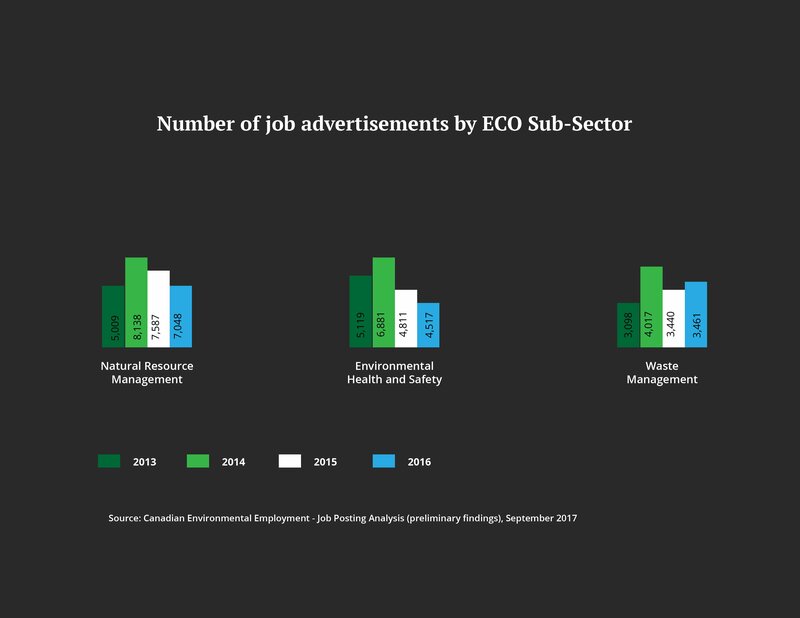 According to our findings, these are the ECO Canada sub-sectors with the highest number of job ads. ECO Canada is developing a model of supply and demand. A combination of drivers, including economic growth, investment cycles, labour availability, productivity and business cycles enables us to project environmental employment going forward. Although this model is still in its infancy, it is possible to project how much environmental employment is going to grow by 2024. This graphic shows some preliminary predictions. At the same time, we’re considering different components of demand, such as economic growth, retirements and emigration. 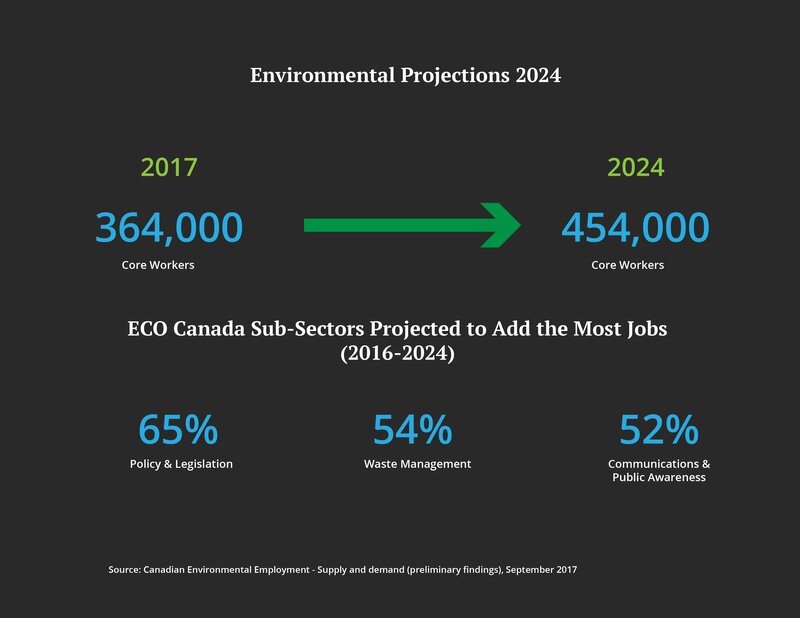 Read our report on Canadian Environmental Employment – Supply and demand (preliminary findings) to get more details on the factors we’re considering to develop our model. In 2015, approximately 44,800 companies were in the Canadian environmental goods and services sector (EGSS), reporting sales of over US$132 billion. These firms employed around 807,350 workers, which is 4.5% of Canada’s 17.9 million employees in 2015. Another interesting finding is that most of Canada’s EGSS encompasses companies operating in the energy sector. In 2015, the renewable energy sector was the largest EGSS category with sales of $59.9 billion followed by the energy efficiency sector with $42.4 billion. The renewable energy sub-sector includes wind, solar, hydro, geothermal and low carbon fuels. Around 22,200 Canadian companies operated in this sector employing approximately 388,700 workers. For more information, visit our “New Ways of Measuring Environmental Employment” section.